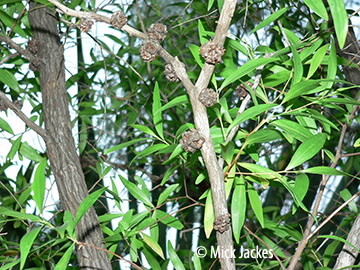 This small tree is a native of Cape York Peninsula. Leaves are to 6 cm long and 12 mm wide, the main veins are longitudinal and more or less parallel to one another, oil glands are present. The red to dark pink flowers are arranged in clusters and are borne on the older branches. The stamens are fused into 5 bundles, about 4 mm of the top portion are free resulting in a brush-like appearance. 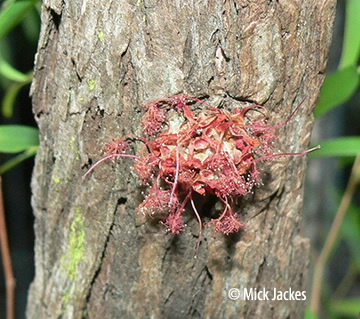 The capsules are fused together to form a globose cluster.